The DJ Hero vs. Scratch: The Ultimate DJ fight continues as Numark and Genius Games today released detailed images of the Scratch controller. 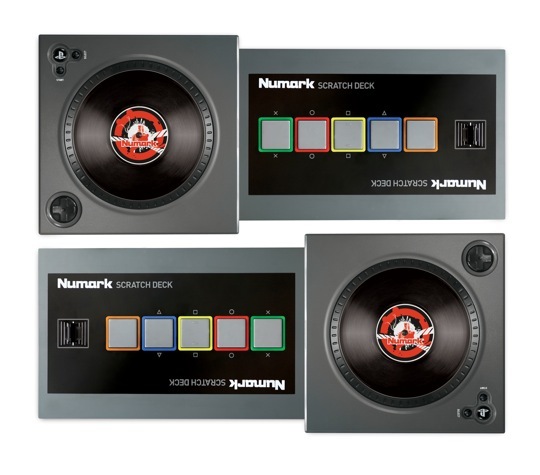 Designed by Numark, the left/right reversible turntable/mixer combo took a more traditional approach by incorporating trigger pads and crossfader off to the side of the vinyl conrtrols. Additinoally, players can customize game play using sounds from 60 battle records that come included in the game or uploading their own samples through a USB microphone. this is going to turn me into the greatest dj ever!!! !